Information: Destry Rides Again, Again takes the form of two tableaux vivants adapted from the 1939 Marlene Dietrich film “Destry Rides Again”, a western in which it is unclear if we’re in 1870, 1939, Texas, Hollywood, or a nightclub. Tableaux were a popular form of 19th century parlor entertainment, largely replaced by cinema. For this piece, we combine Dietrich’s 1930’s cabaret, a 1870’s Texas saloon, and stage it in a 2012 parlor. Instead of physically wrestling one another (as in the abstracted scene from the movie) the actors will be fighting gravity, time, and fatigue by holding their mid-brawl positions for as long as they can. What do you want? : Visions in H.D. Information: Placing architecture, objects, and the silver screen in conversation with the poem “Tribute to the Angels” by poet H.D., Miriam and Emily invite you to contemplate the space between desire and reality, reality and image, and all the in betweens where we find ourselves questioning our perception. 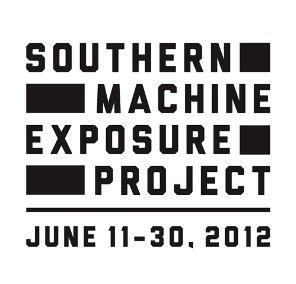 Southern Machine Exposure Project events all take place in private homes that serve as public venues. As a result of the intimate nature of these 20 unique spaces there is limited attendance for each event. If you’d like to attend, you must sign up ahead of time and register online at eventbrite.com/org/994232247. Registration for each project opens 7 days prior to the actual event. One new project opens at daily at noon beginning June 4, 2012. Times and audience capacity varies for each project. Pre-registration is REQUIRED and all events are FREE.